Founded in 1977, the Performing Arts Alliance (PAA) has been the premiere advocate for America’s professional nonprofit arts organizations, artists, and their publics before the US Congress and key policy makers. PAA advocates for national policies that recognize, enhance, and foster the contributions the performing arts make to America. 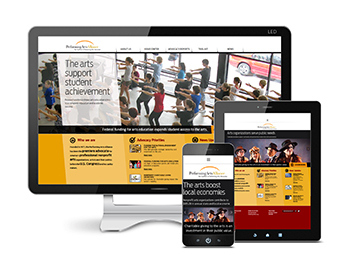 The site also needed to be integrated with Voter Voice, a cloud-based advocacy tool that they use for grassroots advocacy campaigns for federal policies impacting the arts. The new PAA website layout organizes all of their content logically, and showcases the breadth of the organization’s work. We spent considerable amount of time on learning the Voter Voice product and how best to integrate it into their website to meet their specific needs. Now it is much easier for PAA to update their website with current news on policy issues. Everything has a designated place — on both the front end and the back end. Members have a dedication section where they can easily follow the progress of federal issues and see how their grassroots action is making a difference.